George Washington didn’t really cut down the cherry tree, but cherries probably did grow on his family’s plantation. This popular fruit comes in two varieties, pie cherries – which are tart and best used in cooking, and sweet cherries – the dark red or orange cherries people eat fresh. 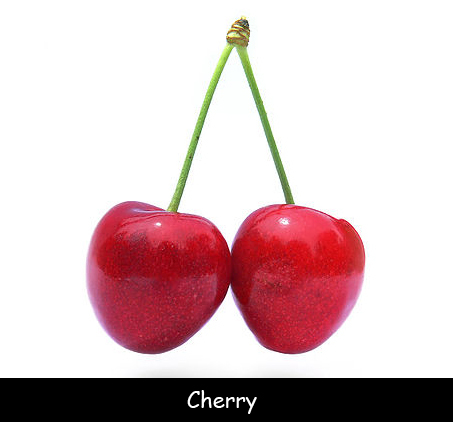 Cherry pits have been found in prehistoric caves in Europe and Asia. Roman soldiers ate cherries as they traveled through Europe, dropping the pits on the ground. The pits grew into wild cherry trees. Europeans brought the cherries we know today from Europe in the 1600s. Chokecherries are native to America. These small, tart fruits were used by Native Americans to make pemmican. People still gather them for syrup and jam. Sweet cherries grow best in mild climates. Most of the sweet cherries grown in the U.S. come from Washington, Oregon, and California. Tart pie cherries can grow in colder climates. Michigan is the largest producer of pie cherries. One cherry tree produces about 7,000 cherries. Brian Krause spit a cherry pit 93 feet at the annual contest in Eau Claire, Michigan. He holds the world record for cherry pit spitting. Pemmican: a high protein, high fat food made by Native Americans from dried, pounded meat, melted fat, and dried fruit. Question: Are cherry pits edible? Answer: Cherry pits are not edible. They contain a compound that turns into cyanide in your body and can be poisonous in large amounts. Not all cherry trees are grown for their fruit. Watch a video about ornamental cherry trees. Declan, Tobin. " Cherry Facts for Kids ." Easy Science for Kids, Apr 2019. Web. 25 Apr 2019. < https://easyscienceforkids.com/cherry/ >.